friends and family that have helped us over the years! .....a group of women met at a stop to get their children off to Moulton Elementary . While they waited, they talked about many things but mostly about . This book club was formed in 1993 by these women and their friends. In 2002, they read a book chosen because of the cover with cute red . It turned out that the book, set in China, was about a group of poor workers that found a stash of Western , all classics. Balzac and the Little Chinese Seamstress is a romantic novel about the magic of story-telling and literature. 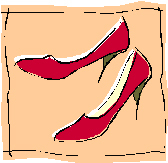 Our club also honors the power of a good book so the club was named the "Red Shoes Book Club" based on this story. While our children have long since left elementary, middle and high school and some have completed college, gotten married and started their own families, we continue to read, meet and enjoy each others company. We created this site to share our of reading with our friends and others in the community and hope to continue for many years to come. Welcome to our website!